As we reach the mid-point of summer, it is time to register for the 2015 EDEN Annual Meeting, to be held October 6-9, in Las Cruces, New Mexico. This year’s meeting logo is “Enroute to the Next 20 Years,” a recognition of our efforts during the first 20 years and look at our vision for the next 20. An exciting pre-conference tour is being planned by the Southwest Border Food Protection and Emergency Management Center. This tour promises an up-close and personal view of the issues facing border states. Participation in this tour is limited, so register soon. The planning committee has put together a great program with workshops, workgroup meetings, a report from NIFA and an update about the new EDEN Strategic Plan, a look at the opportunities EDEN has for collaboration with our 1984 Land Grant institutions, and more. Following the Friday workshop, “Making EDEN Work for You,” those who are interested are invited to travel to Albuquerque, NM for the 2015 Balloon Fiesta. This tour promises to provide a memorable ending to the week. The EDEN Exercise Ad-Hock Committee has been busy this past year and while I don’t want to steal the thunder from their presentation at the annual meeting, their recent survey, measuring the effectiveness and efficiency of EDEN’s ability to disseminate information, provided impressive results. To hear specifics, you will need to listen to Michael Gaffney’s (committee Co-Chair) presentation Wednesday afternoon at 2:30 p.m. Since January, the EDEN Executive Committee has been planning for a September meeting with selected Extension Directors, and Beverly Samuel, NIFA National Program Leader, Jane Schuchardt, Executive Director, ECOP/APLU, and Nick Place, EDEN’s representative to ECOP. The purpose of the meeting is to allow the Extension Directors to provide input regarding the future direction of EDEN. Input from this meeting will be included in the future strategic planning process. We have never had this opportunity to bring the directors to the table for these discussions and look forward to a productive and informative meeting. On July 7, 2015, the Senate Committee on Agriculture, Forestry, and Nutrition held a public hearing on the impacts of Highly Pathogenic Avian Influenza (HPAI) on the U.S. poultry sector. The key witness, Dr. John Clifford, Deputy Administrator of Veterinary Services at the USDA Animal and Plant Health Inspection Services (APHIS), started his testimony with a chilling statement: “Today, we are facing the largest animal health emergency in this country’s history. We are dealing with an unprecedented outbreak of highly pathogenic avian influenza (HPAI) that is taking a heavy toll on the poultry industry.” Indeed, USDA has confirmed HPAI in 21 states, which includes nine states where HPAI was identified in commercial poultry. Of the 232 total poultry premises with confirmed cases of HPAI, 211 are commercial facilities where 7.5 million turkeys and 42 million chickens and pullets have been depopulated. USDA has committed over $500 million – an amount more than half of APHIS’ yearly discretionary budget – in addressing this outbreak. How did this devastating outbreak occur in the first place? According to USDA scientists, the HPAI H5N8 virus originated in Asia and spread rapidly along wild bird migratory pathways in 2014. Dr. Clifford reported that wild ducks and geese brought the disease first to the Pacific flyway, and later to the Central and Mississippi flyways. Initial detections in the United States were in wild birds and backyard flocks, and may have resulted from direct contact with sick migratory birds. USDA epidemiologists believe that wild birds were responsible for introducing HPAI into the environment, and from there it was spread into commercial poultry houses. 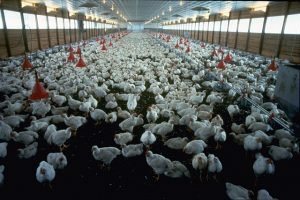 Further investigation by USDA scientists showed that the virus was introduced into commercial poultry facilities from the environment or from farm-to-farm transmission on human sources such as boots or equipment. Dr. Clifford pointed out that APHIS cannot associate transmission of the disease with any single one of those factors, but it seems clear that lateral spread occurred when biosecurity measures that are sufficient in ordinary times were not sufficient in the face of such a large amount of virus in the environment. While the results of USDA’s preliminary epidemiological investigation did not show a single source of transmission, it did emphasize the importance and need for improved biosecurity. Dr. Clifford also stressed that USDA is treating the potential threat of more infections in the fall with the utmost seriousness as it is very likely that wild birds will carry the virus with them when they begin migrating south in the fall. When asked about the use of vaccines to prevent and control HPAI, Dr. Clifford said this is being studied but cannot be adopted until a suitable vaccine is found and trade implications are clarified with countries that import U.S. poultry products. Poultry industry representatives also testified at the hearing and thanked USDA for its support while stating that indemnification guidelines and depopulation and disposal measures need to be improved. No new outbreaks have been reported since the last confirmed detection of HPAI in a layer flock in Iowa on June 17, 2015 and many affected farms are beginning to repopulate their flocks. Gender and Vulnerability in Emergency Contexts This webinar, presented by Andrea Burniske and Susan Green, focused on community planning for vulnerable populations. Enhancing Biosecurity at Fairs and Shows Scott Cotton and Curt Emanuel highlighted the importance of biosecurity before, during, and after these events. Update on HPAI Mixed Origin Virus Drs. Beth Thompson and David Schmitt described the progress of the outbreak in their respective states (Minnesota and Iowa). Learn more about avian influenza on our eXtension site. Three free self-directed avian influenza biosecurity courses are available here. USDA Animal and Plant Health Inspection Service (APHIS) map and chart of current avian influenza findings.